See Dr. Haik in this month’s video “Letter from the Editor” too! 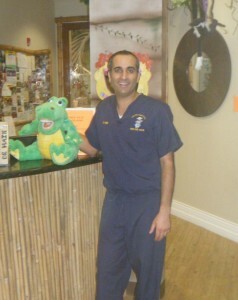 A lot of wonderful things have been said about Dr. Tomer Haik, the “Kids Teeth Doctor,” in Wellington. 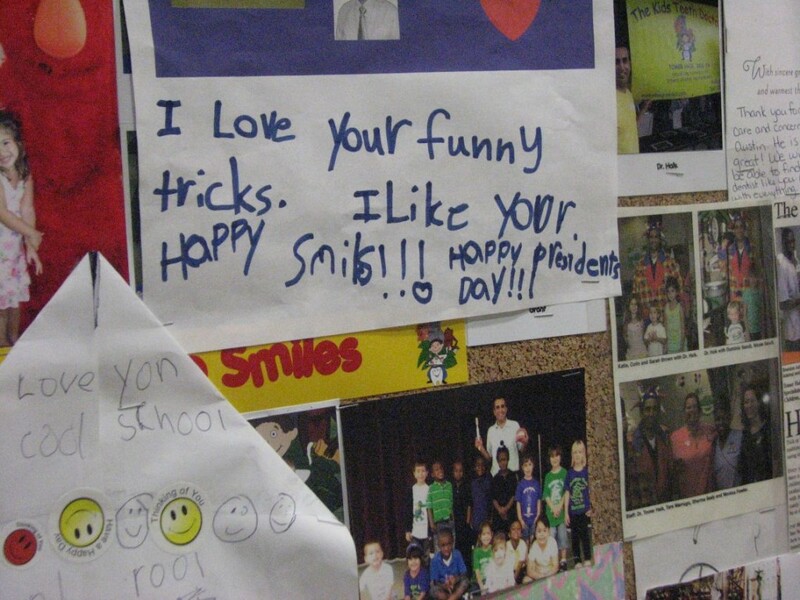 However, the best and most common comment is, “My kids look forward to coming to the dentist now.” Dr. Haik shared a few of the many “thank you” letters from kids and parents with us. He is well-loved in the community and, as my kids have experienced, he has a way of making kids laugh and making them comfortable instead of nervous. Even in just the past four years, dentistry has changed and improved in many ways. Many patients are pleased with the relatively-new aesthetic stainless steel crowns (which have a white plastic coating on the outside). In just the past six months, they have introduced pre-formed porcelain crowns, which also look great and are better for the gums. “It’s a constant learning process,” says Dr. Haik. “There is no textbook on how each child will react. It’s natural for a child to feel fearful or vulnerable. That’s why we have become so good with singing, dancing and jokes,” he laughs. He is both a talented dentist and terrific with his rapport with kids of all ages. How long should someone spend brushing their teeth? It’s about two minutes, according to Dr. Haik. “I tell mothers they have my utmost permission to nag, nag, nag!” he says. 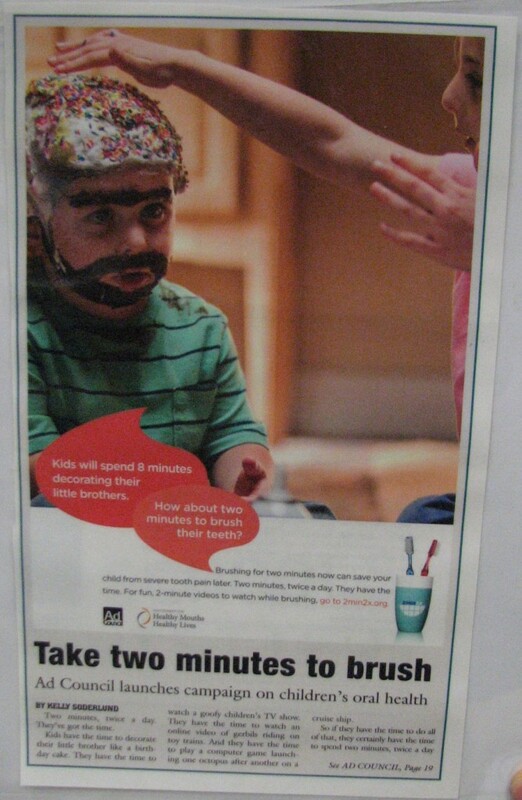 “I tell kids, ‘Don’t rush when you brush.’” Flossing, by the way, is not just for grown-ups, Dr. Haik reminds parents. As soon as the teeth become tight against each other, it’s time to floss too. Another important tip for parents is not to let their kids go to bed with milk or juice. Brushing before bedtime is the best way to go and the only acceptable drink after that is water. Snacking between meals can be very harmful to teeth too, explains Dr. Haik. Fruits and vegetables are better snacks for your teeth and all-around than other snack options. If possible, he warns parents to avoid gummies, which stick on the teeth and tend to do damage. If the kids have gummy vitamins, it’s important to brush well afterwards. a Tiki receptionist area. There are fun movies to be watched, while the kids are lying back in the dentist chairs. They have even thought of the siblings, providing a video game area for those kids who are waiting for a brother or sister to finish. “The number one thing is our friendly staff though,” says Dr. Haik. He makes sure to hire staff members who are very good with working with children. One of the letters on the bulletin board of “thank you” letters and photos in Dr. Haik’s office. Dr. Haik is also enjoying being a father. He and his wife have Joshua (7), Naomi (5) and Nava (who is one and a half). He finds the two worlds, home and work, lots of fun. He is always collecting good comic material, thanks to the things that happen at home and at work. He enjoys magic, Karaoke and playing with Legos with his kids. He also has the latest and greatest in technology when it comes to appointment reminders. When a patient has an appointment, the parent gets emails, text messages and phone calls, according to their preferences. They also get an automatic survey sent after each appointment, so Dr. Haik and his staff can always be aware of how they are doing. Check out his website and Facebook page. He holds occasional contests on his “Kids Teeth Doctor” Facebook page, including the next one – which will be a Halloween costume photo contest. He also is happy to offer a wonderful, post-Halloween event for the community the day after Halloween each year, an opportunity for families to get rid of their extra Halloween candy. The Annual “Cash For Candy” Event…Coming on Thurs., November 1st! On the first day after Halloween (and this year it will be Thursday, November 1st), Dr. Haik’s office presents a Cash for Candy event from 5:30pm to 8:00pm in his office. “We collected 550 pounds of candy last year from kids,” says Dr. Haik. 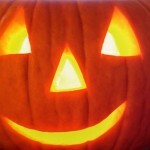 The concept is that kids give up some of their candy, preventing a few cavities. Dr. Haik’s office gives $1 per pound of candy, per child – and if the school is registered ahead of time, another $1 per pound to the child’s school. Save time by filling out a form ahead of time, which can be printed out from “The Kids Teeth Doctor” website. The event is open to the public. They’ve sent the candy to our troops overseas for the past three years. This year they have a request from an organization who helps kids in orphanages for the candy. Overall, it’s a great event and a great way to avoid cavities while raising a little money – for your school and yourself! In summary, if you’re looking for a new dentist for your children, stop by Dr. Haik’s office. He is friendly, knowledgeable and gentle. “We are just trying to keep the young smiles in our community healthy,” says Dr. Haik. See our “AW Coupons” link on this website for a coupon! Individualized Music Lessons. 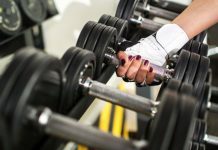 Best New Music Dealer in the U.S.
Around Wellington® is your resource for interesting stories, monthly columns on many areas of expertise, fun contests (with gift cards or tickets to events as the prizes), links to terrific local businesses, a monthly calendar and detailed community information. Learn more.